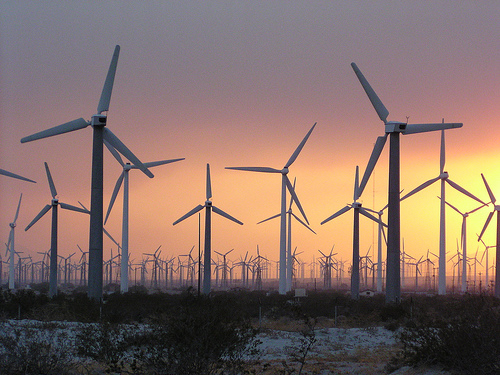 Wind turbines are causing serious health problems. These health problems are often associated, by the people having them, with the flicker and the noise from the wind turbines. This often leads to reports being discounted. Residents of the area around the Ripley Wind Farm in Ontario where Enercon E82 wind turbines are installed feel that the turbines are making them ill. Residents suffer from ringing in the ears, headaches, sleeplessness, dangerously elevated blood pressure (requiring medication), heart palpitations, itching in the ears, eye watering, earaches, and pressure on the chest causing them to fight to breathe. The symptoms disappear when the residents leave the area. Four residents were forced to move out of their homes, the symptoms were so bad. Residents also complain of poor radio, TV and satellite dish reception. There is no radio reception under or near the power lines from the wind turbines because there is too much interference. Local farmers have found that they get headaches driving along near those power lines. The waveforms below were taken at one of the residences in the area. The first waveform was taken before the wind farm started operation. (As you can see, a ground current problem existed even before the wind farm started.) The frequency profile of the neutral to earth voltage changed dramatically after the wind farm became operational (second waveform). There are far more high and very high frequencies present; indicated by the increased spikiness of the waveform. As demonstrated by these waveforms, wind turbines are extremely electrically polluting. Studies and anecdotal reports associate electrical pollution with a similar set of symptoms to those experienced by the residents of the area (1, 2, 3). The symptoms associated with electrical pollution are caused by overexposure to high frequencies and are known as radio wave sickness (4). Technical papers discuss the fact that it requires only very small amounts of high frequency signals (either from transients or communications) on wiring to induce significant electrical currents in the human body. They support findings of human health problems caused by exposure to even small amounts of high frequencies (5, 6). The specific symptoms experienced depend on both the frequencies present and the body type and height of the person being exposed. Increased risk of cancer is associated with exposure to both “dirty” power on wires and electrical ground currents (7, 8). Animals also experience health problems related to electrical pollution exposures. Dairy cow’s milk production and health suffers as exposure to high frequency transients increases (9, 10). Suncor and Acciona have tried to some degree to correct the problem at the Ripley Wind Farm. They buried the collector line from the turbine near some of the most badly affected homes and gave the homes a separate distribution line. They also put an insulator between the neutral line and the grounding grid for the wind farm. As you can see, from the waveform below, it helped somewhat. It reduced the high frequencies being induced on the distribution system by the proximity of the collectors and the high frequencies put directly on the neutral by the tie to the wind farm grounding grid. However, it is still not as good as before the wind farm installation and neither is their health. This is not the only wind farm that seems to be causing serious health problems for local residents. The Enercon E82 does not seem to be unique in its design or problems. Wind turbines generate a sine wave of variable frequency in order to be able to take advantage of the full range of wind speeds. However, the grid only operates at 60Hz, so the variable frequency is converted to DC and then an inverter is used to convert the DC signal to 60 Hz AC. This is the signal that is put on the power line. Most inverters generate an extremely “dirty” signal, which is a 60Hz waveform polluted with a lot of high frequency transients. The previous waveforms are examples of this. The people in this house were so sick at home with the wind turbines running that they had to abandon their home and move elsewhere while they waited for the problem to be fixed. The changes made by the wind farm combined with a neutral isolation device installed by the homeowners has made the home livable, but their health is still affected by the operation of the wind turbines. More information about electrical pollution and health can be found at www.electricalpollution.com. The author can be contacted with questions about electrical pollution at webmaster@electricalpollution.com. Havas M, Olstad A. 2008. Power quality affects teacher wellbeing and student behavior in three Minnesota Schools, Science of the Total Environment, July. Havas M. 2006. Electromagnetic hypersensitivity: biological effects of dirty electricity with emphasis on diabetes and multiple sclerosis. Electromagnetic Biology Medicine 25(4):259-68. Havas M. 2008. Dirty Electricity Elevates Blood Sugar Among Electrically Sensitive Diabetics and May Explain Brittle Diabetes. Electromagnetic Biology and Medicine, 27:135-146. Milham S, Morgan L. 2008 A New Electromagnetic Exposure Metric: High Frequency Voltage Transients Associated With Increased Cancer Incidence in Teachers in a California School. American Journal of Industrial Medicine. Wertheimer N, Leeper E. 1979. Electrical wiring configurations and childhood cancer. Am J Epidemiol 109(3):273-284. Ozen, S. 2007. Low-frequency Transient Electric and Magnetic Fields Coupling to Child Body, Radiation Protection Dosimetry (2007), pp. 1-6. Rogers D.M. 2006. BC Hydro Deals with Farm Neutral to Earth Voltage. September.